Location: Caillac, in the Lot departement of France (Midi-Pyrenees Region). Notes: Château Lagrézette or Lagrézette castle is a French castle in the town of Caillac (Lot).The castle, staircase, dining room, chapel and fireplaces carved large rooms on the first and second floor, the pigeon, are the subject of a classification as historical monuments since October 21, 1982.Lagrézette The castle was built in the sixteenth century by Pierre de Massault whose brother, Gilibert, a man of very fine taste, was Archdeacon of Cahors. It is their father, Adhemar, who wanted the construction of the castle. He had hoped to construct the building on "the little grèze" (a consolidated scree of stones) overlooking the Lot on the property. His son, Pierre Massault of the built in memory of his father and his daughter, Margaret of Massault who from the first shots, christened The Grézette. On the death of his father, Margueritte of Massault inherited the castle. She married Peter Maffre Camburat in 1503. The castle was then owned by the families of Malegat, Lebrun, Belcastel, Malartic, Ambert ... nineteenth and twentieth centuries General Jean-Jacques Ambert (1765-1851) Revolutionary Division General, became the owner through his marriage to Sophie-Amable de Malartic. Joachim Ambert, future brigadier general, was born at Castle Lagrézette February 8, 1804, was inspector general of police, state councilor under the Second Empire, mayor of the 8th arrondissement of Paris, writer, biographer and historian. The castle belongs to Julius then Duverger, a wholesale merchant of Cahors, organizer of a major trade with Asia. The castle remains in his hands until the years of the 1914-1918 war. Count Jean-Roger Alexander - said Axel Bard (descendant of the Leroy family Barde) - then, until 1934, the owner of the castle. This is then sold to Madame Roux-Marce and family Chevalier in the 1939-1940 years. 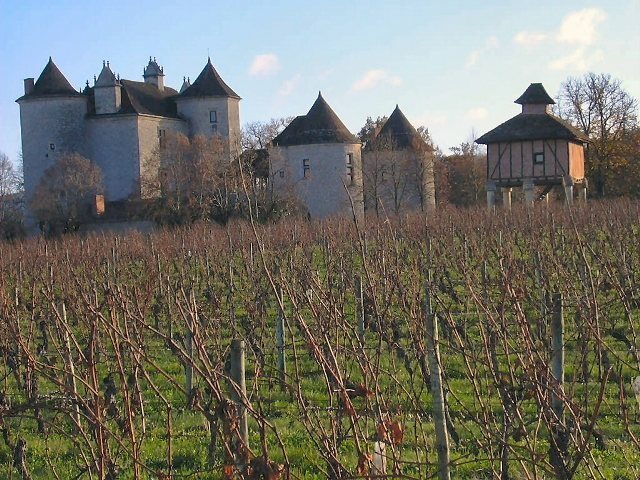 Declining since the 30s, the castle, surrounded by vineyards, is discovered by Alain-Dominique Perrin in 1979. The heart stroke is immediate. He bought the estate a year later and began an ambitious restoration of the castle and its gardens which will last twelve years.